Place names, people's names and company names or brands will now count. Mattel, which brings out a new version of the game containing amended rules in July, hopes the change will encourage younger people to play. Until now a few proper nouns had been allowed which were determined by a word list based on the Collins dictionary. In Scrabble, players try to gain the highest points by making words with individual letter tiles on a grid board. Each letter tile has a points value between one and 10, based on the letter's frequency in standard English. Various coloured squares on the board can double or triple a player's points. Mattel said there would be no hard and fast rule over whether a proper noun was correct or not. 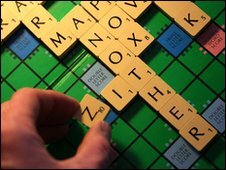 A spokeswoman for the company said the use of proper nouns would "add a new dimension" to Scrabble and "introduce an element of popular culture into the game". She said: "This is one of a number of twists and challenges included that we believe existing fans will enjoy and will also enable younger fans and families to get involved." However, Mattel said it would not be doing away with the old rules altogether. It will continue to sell a board with the original rules.